School can only take you so far. Next comes life. To give yourself the best chance of a fulfilling and successful career you need to keep learning. You know this! But, you don’t have to take the academic route to do so. You have options. The programmes take into account what you've already studied and your future career aspirations. For example, if you haven't got GCSE English or Maths we'll build this in. We know that the school approach doesn't suit everyone, so we'll bring the learning to life by making it relevant to your chosen career path. The programmes are always enhanced with a range of activities and tutorials that our experience and research shows will benefit you. This might range from day trips to nutrition advice or planning how to rent your first flat. Life is bigger and more complicated than any qualification can prepare you for. You need to gain life skills and be able to balance opinions on the world, skills not on the curriculum. What next? Good question. After a Study Programme you’ll be ready to take on a Traineeship, a 6-month work placement in your chosen sector – a real job, with real job responsibilities. 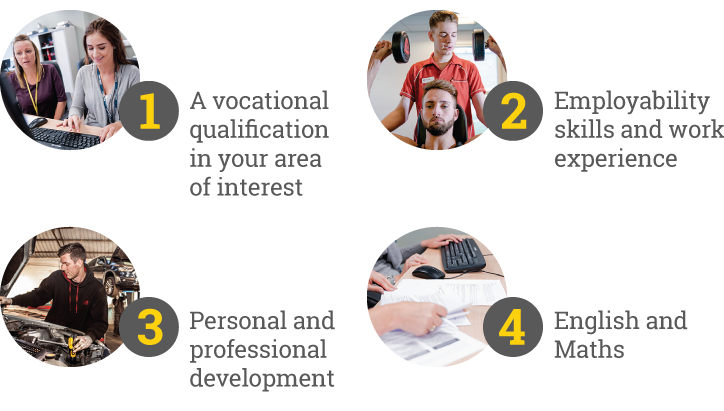 Once you have a Study Programme and Traineeship under your belt you’ve ticked every box to prepare you to succeed as an apprentice.